Moist sandy, acid soil along the margins of and in openings in sandy forests, either oaks or jack pine or both. This seems typically to form a showy, bushy dome-like plant; each branch terminated by a many-flowered inflorescence. 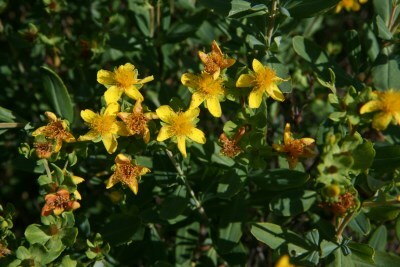 The leaves are broad, the size of those in Hypericum prolificum, however, the inflorescences are strictly terminal and the styles are 5, as in H. kalmianum. Hypericum kalmianum, however, is a calciphile, typically occurring on the great lakes shores or close by in interdunal wetlands; less commonly inland in similar settings. 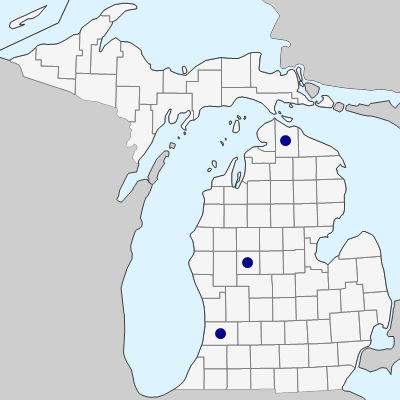 The Michigan distribution of this recently described shrubby species is certainly incomplete. When gathering herbarium specimens, shrubs should be examined for the largest inflorescences and widest leaves (checking vegetative shoots) for collections; small material of this species would be very difficult to distinguish from H. kalmianum. See Wilhelm & Rericha (2016) for more information. MICHIGAN FLORA ONLINE. A. A. Reznicek, E. G. Voss, & B. S. Walters. February 2011. University of Michigan. Web. April 21, 2019. https://michiganflora.net/species.aspx?id=2934.